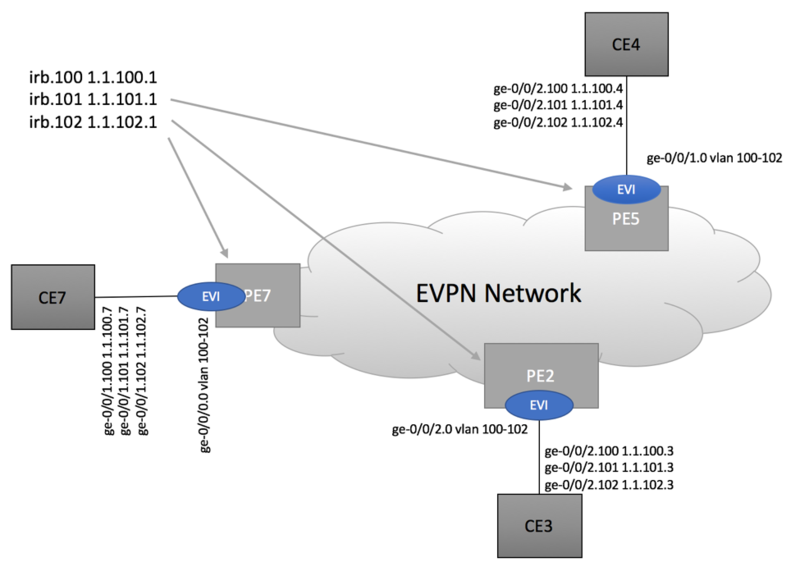 Example below shows configuration element that are directly related to EVPN service being provided on PE2. Please refer to our GitHub repository for complete configurations. In our example, we are configuring individual VRF per IRB. Depending on your use case, you might want to leverage single L3 VRF for all IRB interfaces of a given customer. If everything works as expected, you should be able to achieve end-to-end connectivity between corresponding VLANs. From CE7, we are able to ping VLAN 100, 101 and 102 of CE3 and CE4. Wireshark captures showing CE-to-CE and broadcast traffic can be downloaded here. Captures were take on PE7’s MPLS Network-facing port. Thanks. Very nice article. Much easier to understand rfc after reading this. Can you please explain how vlan-aware bundle works? And How VID translation is happened? what is normaliZed Ethernet tag in rfc 7432? Please explain with some example. RFC is very confusing.